Matthew Stanbrook (right in picture) is Deputy Editor at CMAJ, currently at the CHEST 2014 annual meeting in Austin, Texas. While social media and its intersection with medicine may evoke both interest and anxiety among physicians, medical organizations are paying increasing attention to its potential. Therefore, I was not surprised to find that the American College of Chest Physicians, one such organization has been actively growing its social media presence recently, chose this topic for a plenary address at this year’s CHEST Conference. 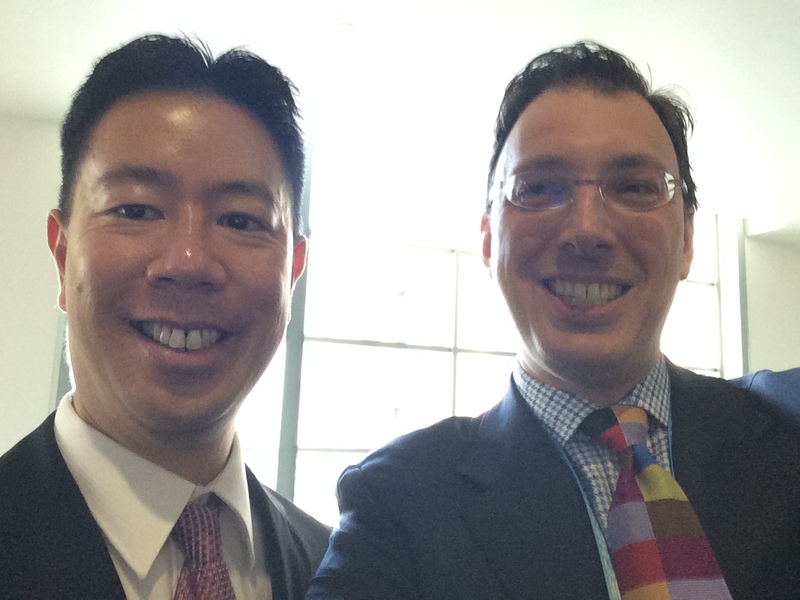 The keynote speaker was one of the most influential physicians on social media today, Dr Kevin Pho (left in picture). Pho was born in the United States, but grew up in Toronto, before returning to the U.S. to complete medical school and specialty training in Internal Medicine at Boston University, after which he set up practice in New Hampshire. His foray into social media began in 2004 when he created his medical blog, KevinMD.com, which subsequently has become one of the most prominent and popular examples of its type. He joined Twitter in 2007, where his presence has been equally strong, amassing 112,000 current followers. Posted in Editors' Blog. Tags: Doc Mike Evans, KevinMD, Matthew Stanbrook, meded. Twitter, medical information, online reputation, social media, ZDoggMD on October 29, 2014 by CMAJ. We all eat too much salt, right? And even if we’re perfectly healthy right now, without individual and population-level efforts to reduce our sodium intake, we are all placing ourselves at risk of the ensuing adverse health consequences. Aren’t we? 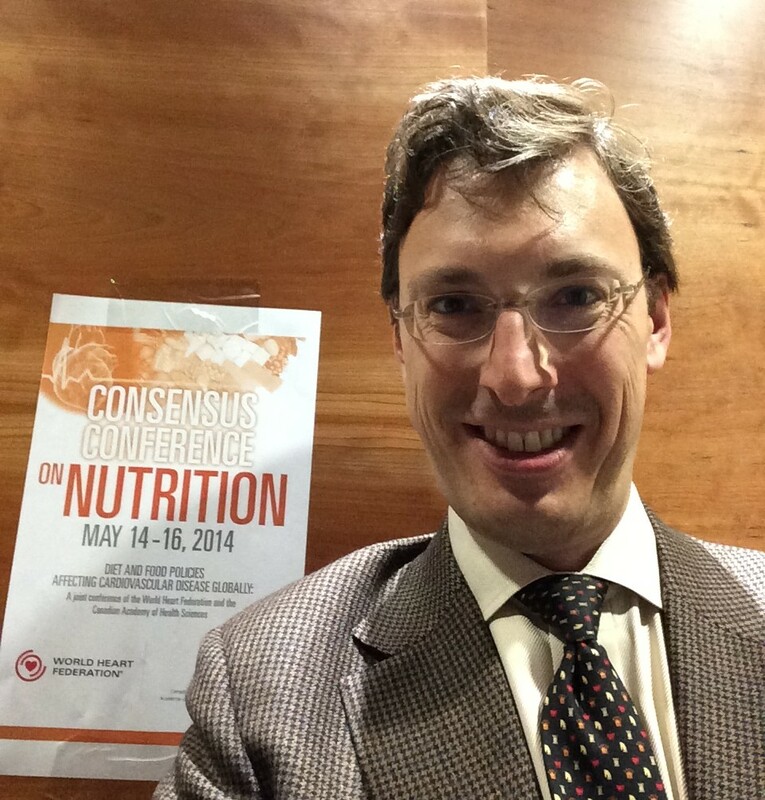 The depth of the debate on this issue was on full display, from some of its leading protagonists, at last week’s Consensus Conference on Nutrition. While I have tended towards cynicism about this debate, considering the influence of the salt industry lobby, what mildly surprised me—and I suspect may surprise many health professionals and most of the public—was how rational and soundly based the arguments are on both sides, and how hard it actually is for an evidence-based clinician to reconcile the two. The average Canadian consumes 3400 mg of salt per day. This is well above the level recommended in most guidelines. Health Canada’s recommendation has long been that Canadians should aim to consume 1500 mg or less per day and should not exceed 2300 mg per day. However, in 2013 the Canadian Hypertension Education Program (CHEP) stirred controversy when it increased the sodium intake limit recommended in its latest guidelines to 2000 mg per day. This may have been grounded partly in pragmatism, considering the feasibility of getting Canadians to consume lower amounts, but it also brought CHEP’s recommendations in line with those from the World Health Organization’s 2012 evidence-based review. Mary L'Abbé, Professor and Chair of of Nutritional Sciences at the University of Toronto and a member of the WHO nutritional guidelines subgroup on diet and health, reviewed the process of developing this guideline and its findings. Based on a systematic review of randomized trials and prospective cohort studies, reducing sodium intake was found to be associated with a modest reduction in blood pressure, but of a magnitude deemed clinically significant. No clear effect was found on cardiovascular disease overall, but reducing sodium appears to reduce the specific risks of stroke and fatal coronary disease, albeit based on low quality evidence. The U.S. Institute of Medicine issued a report in 2013 reviewing the evidence for the benefits and harms of different levels of dietary sodium for preventing cardiovascular disease. Jamy Ard, Associate Professor of Epidemiology and Prevention at Wake Forest School of Medicine and member of the Institute of Medicine Committee on the Consequences of Sodium Reduction in Populations, described the report and its major findings. Bottom line: the population should decrease excessive sodium intake, based on good evidence for its association with cardiovascular disease, particularly stroke. However, the report was unable to assert a clear definition of what excessive intake is, concluding only that evidence is insufficient that lowering sodium intake below 2300 mg per day affects cardiovascular disease outcomes. The definition of “excessive” intake is of course the crux of the whole debate. It is generally agreed that the more one reduces sodium intake, the lower blood pressure will be in proportion, but the experts in the room highlighted the substantial controversy over how well such blood pressure reductions would translate into reductions in cardiovascular events, or at least whether they translate to similar risk reductions in all individuals. Conference chair Salim Yusuf highlighted some limitations of the meta-analyses on which the WHO and IOM reports were based. One salient issue is ecological fallacy, in that the presence and severity of hypertension substantially influences the effect of reducing sodium intake on blood pressure, while normal persons without hypertension or pre-hypertension display little or no blood pressure reduction with decreased sodium intake. On this basis, some question whether reducing salt intake would confer any benefits to normal healthy individuals. We do not give antihypertensive medications to healthy people with normal blood pressures as a primary prevention strategy—is the intervention of reducing salt intake really any different in nature? Even in hypertension, assumptions about health benefits from blood pressure reductions are at odds with randomized trials that have shown no benefits of lowering systolic blood pressure below 140 mmHg with medications in otherwise healthy people. Also, effects on subgroups examined in meta-analyses are subject to reporting bias, in that studies only contribute to these analyses if they chose to report on the subgroups in question. Dr. Yusuf highlighted the need for a meta-analysis that would pool individual patient data from past studies in order to provide clearer evidence. Disagreements over what a "normal" level of sodium intake is deepen when physiological evidence is considered in addition to evidence-based nutrition. Data from experimental animals supports adverse effects of prolonged increased salt intake on the heart, blood vessels and kidneys. It seems to me, however, that drawing conclusions from this for human health depends on how accurately such models can represent normal human dietary intake patterns. According to Theodore Kotchen, Professor in the Division of Endocrinology, Metabolism, and Clinical Nutrition at the Medical College of Wisconsin, a key difference between hypertensive and normotensive persons is in renal sensitivity to salt: hypertension is associated with a "natriuretic handicap", in that a higher renal perfusion pressure is required to excrete a given amount of sodium. This salt sensitivity has been shown to be modified by genetics and race (in particular, hypertension in African Americans occurs in the presence of a lower plasma renin activity and higher aldosterone levels compared to hypertension in other racial groups). Sodium retention resulting from this renal sensitivity may then signal neural and vascular mechanisms that further potentiate sodium retention. Of note, salt sensitivity is also modified by potassium intake, which on a population level is to low; increasing our dietary potassium intake to match our sodium intake is another dietary strategy that can address this problem, as the WHO also recommends. David McCarron, Visiting Professor of Nutrition at the University of California-Davis, expanded on the physiological basis for estimating normal sodium intake, observing that our drive to consume sodium is mediated by neurological signals that come from aldosterone and angiotensin II, thus indicating that sodium consumption is a physiologically set parameter. As further evidence for this, our taste receptors for salt are unique in having bidirectional effects: when they detect lower levels of salt, they stimulate appetite, but at higher levels, they stimulate aversion to further consumption. What I find missing from this argument, however, is the fact that our taste preferences for sodium have been shown to be modifiable based on our consumption habits: after a few weeks, persons who reduce their sodium intake adjust to the lower level, no longer perceive foods to lack salt, and may begin to perceive foods they previously consumed as too salty. This would seem to suggest that our physiological set point for sodium may be modifiable by behavioural and environmental factors, which would seem to have crucial implications for the process of estimating what normal intake is. Another estimate of what our body considers normal sodium intake can be obtained from looking at the point at which homeostatic mechanisms kick in to cause the body to retain sodium: this is represented by plasma renin activity, which in healthy individuals begins to increase from basal levels when sodium intake drops below an average of 2300 mg per day—equivalent to the consumption level recommended by US guidelines. Interestingly, this also approximates the lower limit of how much sodium populations in different regions of the world will consume if left to their own devices. Dr. McCarron, who has been a controversial leading figure in the salt debate for his contrarian views as well as his consulting relationship with the salt industry, emphasized how the sodium intake varies across place and time within a relatively narrow range from about 2300 mg to 5000 mg per day, despite vast differences in dietary habits and changes in the composition of available foods. According to him, this argues against the sodium content of the food supply being the driver of our sodium intake, and instead supports the notion that humans are physiologically driven to adjust their consumption in response to dietary availability. In refutation to these arguments, Lawrence Appel, Professor of Epidemiology and International Health at Johns Hopkins University, presented the case for population-wide sodium reduction based on the near-ubiquity of hypertension risk (which approaches 90% over a lifetime), its high population prevalence (a quarter of all adults in the world have hypertension) and its leading contribution to the global burden of disease. Blood pressure rises throughout life, but the rate of rise is associated with sodium intake. There is evidence that this process begins in childhood, perhaps even in infancy. While acknowledging the physiological phenomenon of sodium sensitivity, Dr. Appel pointed out that there is no readily available test for this at present. People should therefore not assume that concerns about sodium intake don't apply to them unless and until they develop hypertension; rather, these concerns probably apply to almost everyone. Another area of great controversy is whether a low sodium intake might actually be harmful. Some studies have documented increased cardiovascular events with lower levels of sodium intake, while other large studies have not. Niels Graudal, Senior Consultant in the Department of Rheumatology at Copenhagen University Hospital, presented results from his recently published systematic review that compared studies of low v. usual or usual v. high sodium intake. Low sodium was associated with increased all-cause mortality. Martin O'Donnell, Associate Clinical Professor of Hematology and Thromboembolism at McMaster University, presented soon to be published results from the large Prospective Urban Rural Epidemiological (PURE) cohort study, which has observed a similar J-shaped association with sodium intake and mortality. Dr. Appel questioned whether this association was true, suggesting that more likely explanations are reverse causality (sick patients reducing their food intake overall) or measurement error (underreporting of sodium intake being associated with poorer health behaviors). However, Dr. O'Donnell observed that persons with low sodium intake in these studies are precisely those who are meeting current guidelines for dietary sodium. "It is illogical to say that participants with the lowest measured sodium had implausible levels of intake—and yet recommend that intake level for the whole population," he stated. What should—and shouldn't—we eat? A confusing and sometimes conflicting mass of information seems to arise continually from new research studies, media reports, and popular fads (think gluten-free) related to our diet. The 2014 Consensus Conference on Nutrition, co-sponsored by the Canadian Academy of Health Sciences and the World Heart Federation, was convened to bring together Canadian and international experts on how diet and food policies affect cardiovascular disease globally to highlight both the extent and limitations of our current knowledge. The conference was hosted by World Heart Federation President-Elect and recent Canadian Medical Hall of Fame inductee Salim Yusuf. Using evidence to guide ourselves towards healthier diets requires not just examining what we eliminate from our diets, but also considering what source of calories we substitute in its place (or else we lose weight – usually a good thing in itself, but a separate issue). Walter Willett, Professor of Epidemiology and Nutrition at Harvard University’s School of Public Health reviewed our current understanding of evidence on dietary fats and oils. He recalled that in decades past, U.S. national dietary recommendations had appropriately emphasized reducing saturated fat consumption, but recommended replacing them with carbohydrates – a strategy that leads to increased risk of cardiovascular disease, as it turns out. The solution instead is to substitute healthier fats for less healthy ones. Along these lines, the greatest diet-based reductions in coronary disease risk have been associated with replacing trans fats with unsaturated fats, as demonstrated perhaps best in the Nurses’ Health Study. But some confusion has arisen over conflicting conclusions from a recent high-profile systematic review of dietary fats and coronary disease, in which the authors’ bottom line was that the evidence does not conclusively support current guidelines that encourage higher consumption of polyunsaturated fats and lower consumption of saturated fats. Dr. Willett critiqued these findings, emphasizing the strong influence of one outlier, the Sydney Heart Study, in which all fats were replaced with sunflower oil (which has no omega-3 fatty acids) and a margarine high in trans fats. In contrast, he emphasized that studies of diets including a combination of omega-3 and omega-6 polyunsaturated fats have shown more homogeneous evidence of benefit, as do omega-3s alone if studies focused on specific omega-3 fats are pooled with studies looking at combinations of omega-3s. Is cholesterol bad for us? Ronald Krauss, Senior Scientist and Director of Atherosclerosis Research at Children’s Hospital Oakland Research Institute addressed this from the perspective of how genetic analyses have been able to predict clinical effects of therapeutic interventions on disease biomarkers. Genes that influence LDL cholesterol are associated with cardiovascular disease risk, consistent with benefits documented for treatment that lower LDL. Similarly, genes that influence HDL cholesterol are not associated with cardiovascular disease risk, consistent with the failure of treatments that elevate HDL to show consistent reductions in cardiovascular events. Even for LDL, it may be more complex than we realize to shape our diets to address cardiovascular risk. Lowering saturated fat consumption mainly reduces large LDL particles. Lowering carbohydrate consumption, in contrast, reduces the more atherogenic small and very small LDL particles – independently of saturated fat consumption. Dietary efforts directed against saturated fat therefore may not entirely capture the cardiovascular risk related to cholesterol. From where should we get our protein intake? 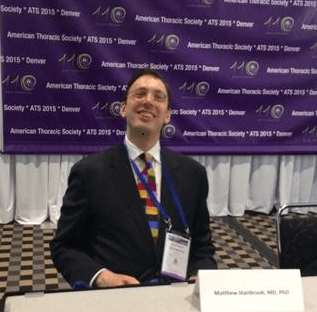 Adam Bernstein, Research Director of the Wellness Institute at the Cleveland Clinic, discussed that evidence for associations with red meat consumption and cardiovascular disease has been inconsistent. More compelling, however, have been findings that substituting red meat consumption with nuts, poultry, legumes or fish is associated with reduced mortality. Daan Kromhout, Professor of Public Health Research at Wageningen University, The Netherlands, reviewed evidence that fish consumption is associated with reduced mortality from coronary disease. However, the benefit is seen only with fatty fish, not white fish, and seems to plateau at a level of one serving per week – higher levels of consumption have not shown greater benefits. A potential down side is that fatty fish also contribute relatively high amounts of calories from saturated fat as well as their polyunsaturated fat content. Eggs may be OK—a recent systematic review found that egg consumption at a relatively high average rate of one per day was not associated with coronary disease or stroke, although the large Physicians’ Health Study and Atherosclerosis Risk in Communities (ARIC) studies observed a small associated increase in the incidence of heart failure. Adding further confusion to the story regarding both fish and eggs, Andrew Mente, Assistant Professor of Clinical Epidemiology & Biostatistics at McMaster University, reviewed data from 3 large epidemiologic studies showing variable results regarding protective effects of these foods depending on the presence or absence of baseline cardiovascular disease and on the region of the world being studied. Such studies have typically not captured important potential confounders such as the types of fish, cooking methods, or variation in nutritional composition of the same foods based on geography. David Jenkins, Professor and Canada Research Chair in Nutrition and Metabolism at the University of Toronto, discussed findings that dietary patterns that source proteins from plants are associated with lower risk of coronary disease and diabetes mellitus. Studies of a dietary portfolio constructed on this basis have shown reductions in LDL cholesterol similar in magnitude to that achieved by statins. The need to focus on dietary portfolios, whole foods and whole diets rather than single nutrients or supplements was another key theme emerging from the discussion. One of the best validated diets to date is the Mediterranean diet, characterized by a predominance of olive oil, fruit, nuts, vegetables, and cereals and moderate amounts of fish, poultry and wine. Miguel Mártinez, Professor and Chair of Preventive Medicine and Public Health at the University of Navarra, Spain, reviewed results of landmark studies that have shown the cardiovascular benefits of the Mediterranean diet, in particular the recent PREDIMED randomized trial, which he led. This large study observed a 30% reduction in the hazard of major adverse cardiovascular events with a Mediterranean diet. While we in wealthy developed countries may obsess about how diet affects our own health, we must not forget the rest of the world, where rapid changes in economic development are being accompanied by changes in the types of foods available and with this, rising trends of diet-related problems such as cardiovascular disease and obesity. Dariush Mozaffarian, Associate Professor of Epidemiology at Harvard University’s School of Public Health, reviewed recent evidence on global disease burdens showing that 6 of the 20 leading risk factors for disease are dietary, the greatest of which is low fruit consumption. However, because available foods and dietary cultural preferences vary dramatically from one country to another, we cannot assume that recommendations for dietary health derived from Western countries with Western lifestyles should apply the same way globally. Research initiatives are beginning to address this issue. Another Harvard School of Public Health Research Scientist, Vasanti Malik, described work she is doing with the Global Nutrition and Epidemiologic Transition (GNET) study, which is conducting focus groups in different countries to assess the cultural acceptability of different food substitutions, such as replacing refined white rice with whole-grain brown rice, which has been associated with reduced risk of diabetes. On the final day of the conference, the participating experts met in a working group to craft summary statements arising from the meeting, chaired by Dr. Willett. This workshop was held in camera, but I spoke with Dr. Willett beforehand about future directions for health policy regarding dietary advice for healthy populations. The U.S. Food and Drug Administration is at long last moving towards eliminating trans fats, a development that CMAJ encourages emulation of in Canada. The next battle, according to Dr. Willett, may be over health-related differences in subtypes of carbohydrates (added sugars, high v. low glycemic index, whole grains v. refined products). On this front, if New York City’s experience is any indication, there will be plenty more debate and controversy to come.